Please get me your submissions by the 25th of October by sending them to timetravel@movierob.net Try to think out of the box! Brief Synopsis – In order to save the two most famous people in history, a man is sent back 600 years in time to help them pass a history exam. My Take on it – Anyone who grew up during the 80’s, probably has seen this movie because of its cult status. 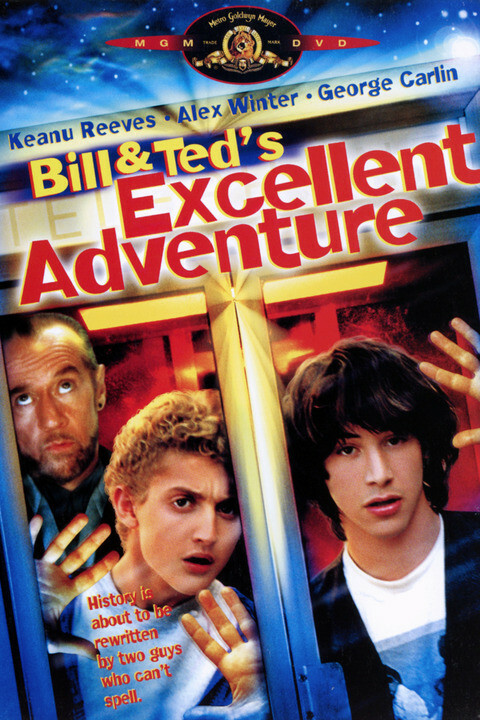 The acting is borderline here and the dialogue is VERY late 80’s but how can one not enjoy such a classic movie like this featuring Bill and Ted. Yes, they used many innovative and ingenious ideas to get things done (like promising to do something in the future in order to effect the now) which make little sense at all, but still entertain. The plot is super thin, but it’s great to see how two high school screw-ups interact with famous historical figures and to see how these figures would perceive the 1980’s. Keanu Reeves and Alex Winter are both great in these roles which have become iconic over the years and casting George Carlin as Rufus was a great idea, because he always does a wonderful job. Yes, this movie truly is far from being perfect, but it’s still worth watching just for the sheer enjoyment of it all. Bottom Line – Cult classic that lacks a real plot, but is fun to watch how the characters interact with famous figures from history. Reeves and Winter are iconic in these roles and Carlin is great as always. Far from perfect, but worth checking out at least once. Recommended! Genre Grandeur Worthy? – As entertaining and fun as this movie is, it just isn’t great enough to be considered among my all-time favorites of the genre despite being close. Party ON DUUUDES. I just love it that Jane Wielden(I think that’s how it’s spelled) from The GO GO’S is Joan of Ark. Yeah the movie is a lot of fun, but very cheesy. Great line. Loved how they kept repeating it too. Glad to see u back in action Vern! This movie is so dumb but I LOVE it. Interesting bit of trivia at the end. I like how you call out the DrWho reference. Thanks for the blast to the past. Today’s youth need to see this too! Party on!